This is a flavorful slow cooker beef stew with beans. It's a delicious and hearty meal your family will enjoy. Like many stews, this one is versatile. If there is a vegetable your family isn't fond of, simply omit it or replace it with another one. Green beans, diced rutabaga, and potatoes are good additions. Or add more tender vegetables—such as frozen peas, fresh sliced zucchini, or chopped spinach—about an hour before the stew is ready. The stew calls for canned pinto beans, but, for extra color, a combination of pinto beans and black beans is an excellent alternative. Or use whatever canned beans you happen to have in the pantry. Add a skillet of freshly baked cornbread and a tossed salad, and you'll have an enjoyable and satisfying family meal. Cut the beef into 1/2-inch pieces. Transfer the beef to a bag and add the flour. Shake to coat thoroughly. Heat the olive oil in a large skillet over medium-high heat. Add the beef pieces; cook until the beef is well browned, stirring frequently. The caramelized crust on the outside of the seared beef gives the stew color, texture, and deeper flavor. Meanwhile, peel and chop the onion into 1/4-inch dice. Slice the celery and carrots, and chop the bell peppers. Drain the beans in a colander and rinse them briefly with tap water. 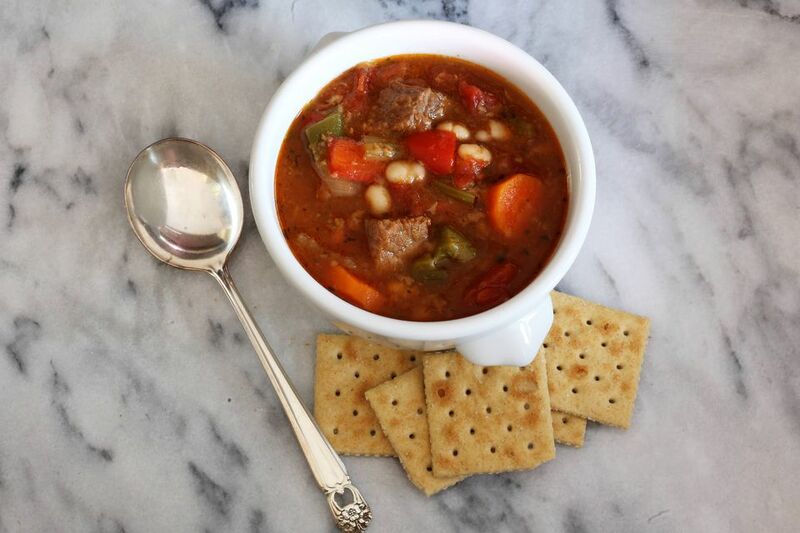 In a 4-quart or 6-quart slow cooker, combine the chopped onions, sliced celery, carrots, green and red bell pepper, seasonings, beans, beef broth or stock, tomatoes, and the browned beef. Cover the pot and cook on high for 4 to 5 hours, or on low for 8 to 10 hours. Add corn kernels about 1 hour before serving time, if desired. Tough yet lean beef makes the best beef stew. The connective tissue in the tougher cuts breaks down over the long period of cooking, making the beef melt-in-your-mouth tender. Plus, it's much easier on the budget. Lean pot roasts, such as chuck, chuck arm, bottom round, or rump, or beef labeled "lean stewing beef" are excellent choices. Short ribs are another good beef for stewing. If you use a fattier beef, plan to skim the excess fat before serving. Stay away from beef eye of round, sirloin, and tenderloin; the longer they are cooked, the tougher they get.